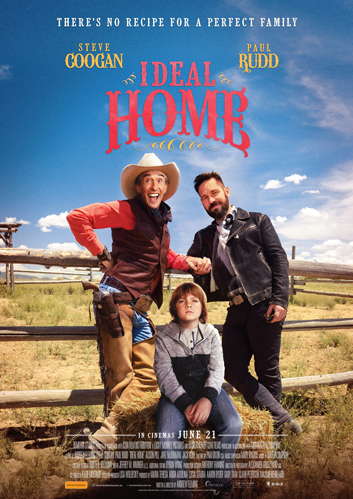 In 'Ideal Home', celebrity chef Erasmus (Steve Coogan) and his partner Paul (Paul Rudd) have a happy and rather self-indulgent life together. Their perfect existence is turned upside down when, at a dinner party, Erasmus is confronted by the grandson he never knew he had. With the child’s father in prison it seems he has nowhere else to go and so, after much debate they decide to take him in. With changes and challenges on both sides, this could prove a recipe for disaster. Filled with heart and humour, this new family looks set to serve up one of the most deliciously funny films of the year. Click here to read our theatrical review of 'Ideal Home'. The 'Ideal Home' competition has now closed. Winners will be announced shortly. Competition opens at 5pm AEST on Sunday 10th June 2018 and closes at 11:59pm AEST on Sunday 17th June 2018. One winners will be chosen at random on Monday 18th June 2018. To successfully win, entrants must fulfil the above entry conditions before the time the competition closes. Current members/followers are eligible to enter the competition. Only one entry per person. Only one winner per household. To be a valid winner, the entrant must not have won a prize from SWITCH within the last 28 days. Each winner will receive one 'Ideal Home' prize pack. By entering, you agree to receive occasional emails from SWITCH in the future. If you decide to unsubscribe from these updates, any further entries will not be applicable. Only Australian residents are eligible to enter. 'Ideal Home' is available on on Thursday the 21st June 2018 from Icon.